Size: 45 x 52 cm. Title: "America Septentrionalis. Amstelodami. Excusum apud Iodocum et Henricum Hondium. Anno 1631." A very rare Italian version of a famous map with editions by Hondius/Jansson from 1631. The map contains the famous cartographic details of the first version: California prominently as an island (the first Dutch map to do so, complete with a note explaining how this "discovery" came about), much of the rest of the country unexplored leading to decorative touches to fill the space - interesting animals, ships etc.- and some inventiveness in the area of the Great Lakes. The decoration continues in the sea areas, with more ships, sea monsters, and a compass rose. There is also a fine Title Cartouche featuring American Indians etc. The map is in excellent condition, with what I take to be original hand colouring, and full margins. It is a little rough and torn on the upper and lower edges (one tear has been given a little archival tape verso to stop it spreading), but there is nothing there one might not expect to find in a 300-year-old map, nor anything encroaching onto the image itself. 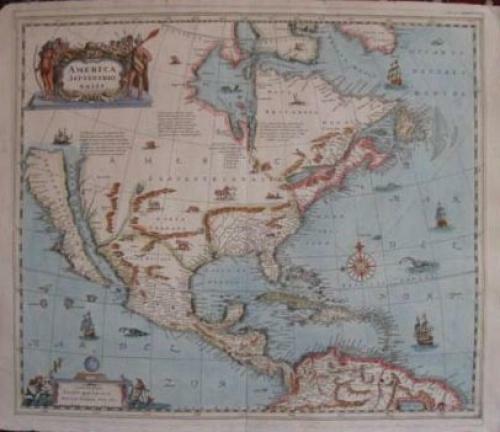 Notes: Described in Philip D. Burden's Mapping of North America, 245, as probably an Italian reproduction of the late 17th or early 18th century. Note 2.) Lawrence H. Slaughter Collection ; 724. Note 3.) National Endowment for the Humanities Grant for Access to Early Maps of the Middle Atlantic Seaboard. Note 4.) Relief shown pictorially.